Kawasaki Vulcan VN900 Classic and my calves! Okay so I've been riding for three or four years now, before my Vulcan I had a Honda Shadow Aero 750. I outgrew it and bought my 2012 in Sept/Oct of last year. My question for the ladies that have a Vulcan 900 is this. Do you find that after a long ride the air being blown off the engine essentially "burns" the engine side of your left calve? In the cooler weather in full leathers it's not so bad, but riding this summer it's really noticeable. I literally have a large red, almost 1st degree burn on the inside of my left calve after a long ride. Yes, I do wear jeans and boots. NO, I'm not touching anything hot with my leg on that side, it's purely from the ....exhaust, for lack of a better word...coming off that side of the engine. I've researched this in the Kawasaki forums and did find one man posting pictures of his wife who had the EXACT same "burns" on her leg as mine. Believe me finding those pictures was vindication because my husband up to that point was of the opinion I was resting my leg against something, big argument. And this coming from a man who's got a 3rd degree burn scar on his leg from his own pipes! I've been riding long enough to know what not to rest my darned leg against! I've posted this in the Kawasaki forum again since that last instance was way back in '08, but have yet to get a response. Then I thought...HEY, I'm sure one of you all have the same bike as me! Please let me know if you've noticed or have this issue and if you've resolved it, how? 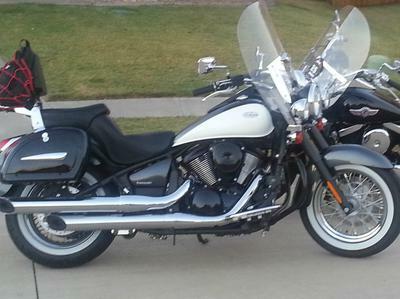 Comments for Kawasaki Vulcan VN900 Classic and my calves! I have a Mustang Wide Touring seat w/ backrest, so maybe I'm sitting a bit farther back? I have a 2009 Vulcan 900 LT. I don't have any problem w/the heat coming off the pipes & I rode everyday in 90+ degree weather a couple weeks ago. I am 5'6" & have a long torso & short/fat legs. Sorry I can't be of any help.